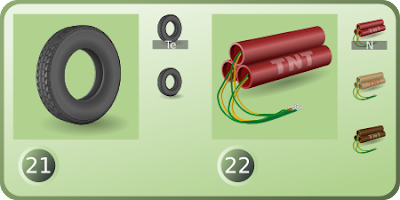 Made some changes to the tyre for Tellurium (after the preview) and finished the TNT for nitrogen. Have started work on a flashlight for Kr (krypton). also try to use a standard prespective. The icons is presented on white background on the Kalzium icon-set site. I wanted here to show them with color background since the Kalzium has color (but I don't know if the colors will show on the icon-view). It can be boring with the green I guess, but this is only for work in progress. I try to use a few standard perspective, but zoom in and out, look from over and under more freely to get the objects recognizable in the small size (40 x 40) pixel (I also have to leave room for some air - at least on most of them, since the icons is placed tight together). The lighting of the objects should be for the most similar though. I think some of the drawings needs some additional work later and I plan to do some finishing later. Thanks for your input. Very nice, the only thing I'd change is to move the postion where the fuse enters the dynamite. Appears to me its off centre (needs going left a bit).